We deal with all types of emergencies such as blockages, chimney fires, smoke coming into your room and carbon monoxide detectors that have been activated. If you suspect anything is incorrect with your system, please do not hesitate to contact us to make sure your home is safe. We charge a £90 call out fee for emergencies, we normally arrive within an hour of being called, depending on location and time. This is our standard cleaning service. We use a range of tools and methods custom to your chimney/flue needs. This includes power sweeping and vacuum. The fee for cleaning one chimney is £45. If you require any custom cleaning, for example from the roof down, there will be an additional cost depending your requirements/chimney design/height of building etc. Quotes for all work will be given before any work is carried out. Certificates for home insurance are available on request. 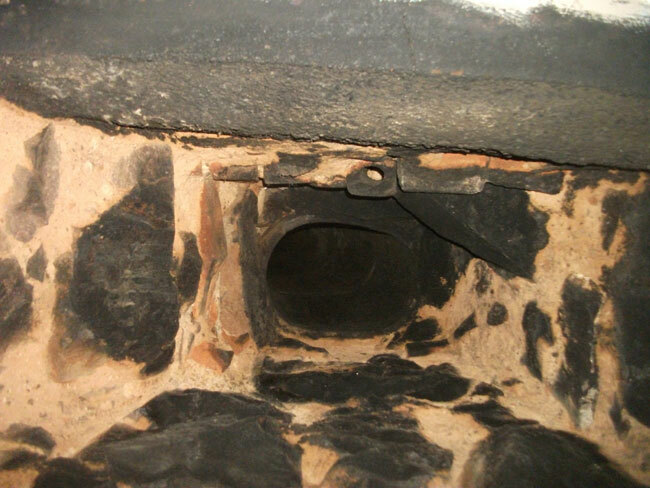 Before Power Sweeping the flue is coated with soot, restricting the airflow and potentially trapping dangerous particles. 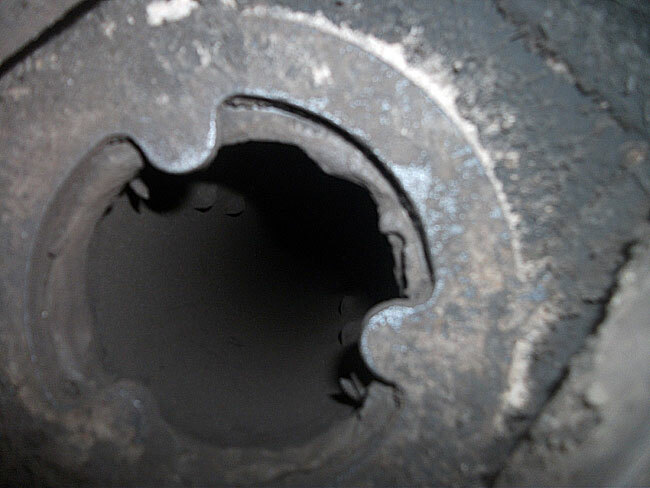 This level of dirt is common on regularly swept chimneys/flues. After Power Sweeping the flue is left clear of soot. Instead of just brushing the top surface of soot off the Power Sweep will remove more stubborn particles of soot. his is our premium service which includes a full powersweep service and a CCTV inspection of chimney flue. We always powersweep before before inspecting your system to make sure your system is clean for inspection. The fee for cleaning one chimney with inspection is £90. Using our CCTV inspection equipment we can access the structure of your system to check for any damage or wear and tear. On inspection we will notify you of any defects within your system -we'll show you and explain the problem allowing you to understand the situation. We clear a lot of blockages, below are some costs for the typical cases we deal with. If you have another problem pleae get in contact and we can quote you for the work. Common blockages are caused by birds nests, left unchecked these blockages can become dense and extremely dangerous. We inspect your complete system to make sure it is efficient but more importantly safe to use. This chimney cowl has been coated in cresote and soot over the the years reducing the ability of the chimney to draw away smoke and particles effectively. We also undertake repairs and servicing of chimneys / flues. This includes, replacing cracked bricks and worn fire ropes on wood burning stove. If you have any queries pleae get in contact. If you have reason to question the safety of your system, no matter how small, please don’t hesitate to contact us. We make sure your system is clean and efficient from top to bottom, this image shows a build up of material in an Aga system. We inspect all different types of systems, from open fires to wood burners, Aga's and Rayburns. We will alert you to any damage and suggest the appropriate repairs. Call Staffy or Amanda on 07753 709463 or 01343 547620 to get your system swept and checked.